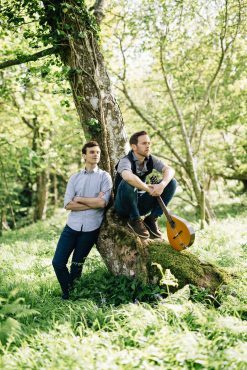 Ninebarrow Ninebarrow are a multi-award-winning folk duo, who occupy the middle ground between Simon & Garfunkel and Seth Lakeman. Described by Mike Harding as sounding ‘damn fine’, Jon Whitley and Jay LaBouchardiere combine breath-taking vocal harmonies and melodies, delivering original songs that are inspired and rooted in the landscape and history of the British Isles. As well as crafting unique and engaging original material, Ninebarrow also take a wide-range of traditional folk songs and rework them in their own, distinctive way.